Thailand is a popular destination for gap year travels. From the bustling Bangkok markets to the laid back beaches of Koh Samui, Thailand contains a variety of destinations to suit almost any type of traveller. For those looking for something more substantial than a suntan, a host of volunteer programmes exist, including building houses, teaching English and helping in orphanages. These programmes often book up fast, so if you want to spend an unforgettable year in Thailand, begin planning today! Thailand, known as Siam until the mid-1930s, was the only South East Asian nation never colonised by a Western power. Thailand sits just to the southeast of Burma/Myanmar, bordered by both the Andaman Sea and the Gulf of Thailand. 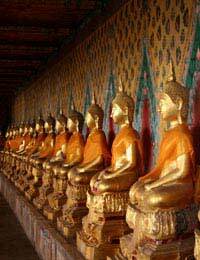 It is divided into 76 administrative provinces, with Bangkok as the capital city. Thailand experiences a tropical climate with a wet monsoon season running from May to September. While this rain may make the outdoors seem hot and steamy, air-conditioning can leave even the most seasoned traveller chilled. Avoid any climate confusion by packing: sturdy walking shoes, boots, and/or sandals, a light raincoat, a hat, for rain and sun, layers of clothing, including pants and a sweater, swimsuits, a comfortable backpack. When you're ready to tackle the Thai elements, contain your enthusiasm long enough to investigate travel vaccinations, such as for hepatitis A & B, Japanese encephalitis, rabies, typhoid, yellow fever, boosters for tetanus and measles, and anti-malarial tablets. Travel insurance isomething you should not leave home without and it's a good idea to take travel and medical insurance claims forms with you. Make sure you have any needed prescriptions and any visas that you might need. It is often advised that non-essential travel be curtailed in the southern provinces due to insurgency. The provinces of Pattani, Yala, Narathiwat, Songkhla and Satun should be avoided. The risk of terrorism is high throughout Thailand, and Westerners should understand that they may be at risk - keep track of the local news in the areas you plan to visit. A coup in September 2006 installed a new Prime Minister in Thailand, and while the situation was non-violent, travellers should be aware of political unrest. There have been outbreaks of Avian Flu in Thailand, so travellers are advised to avoid live animal markets and ensure that their poultry dishes are cooked appropriately. Thailand is an incredibly cheap place to be a traveller. In major cities, youth travellers may be treated to even further discounts if they hold an: International Student Identity Card (ISIC) - must be a student, an International Youth Travel Card (IYTC) - must be under 26 years of age, or Youth Hostel Association - cheapest if you are under 26 years of age. Ko Rattanakosin, the old royal city area of Bangkok. Khao San Road, Bangkok which is a budget traveller's delight. The world's tallest Buddhist monument at Nakhon Pathom. The floating market at Damnoensaduak. "The Bridge over the River Kwai" and Allied war cemetery at Kanchanaburi. Bang Pa-In Palace, the summer residence of Chakri kings. The Khao Luang Caves full of Buddhas. The beaches of Hua Hin, also the summer residence of the Thai royal family. The historic temples of Chiang Mai. Annual boat races at Nan. Anywhere OTHER than Bangkok to celebrate Songkran (Thai New Year) on April 13 - the city is a ghost town as residents return to their home communities. Travelling to Thailand requires common sense to stay safe. Keep your valuables locked at your hotel or hostel, leave jewellery and other easily stolen items at home, and keep your wallet/camera/passport on you at all times. Never watch bags or carry items for strangers, alert authorities to suspicious behaviour, and never travel alone to secluded outposts. Keep in contact with family and friends at all times, keep up with local news, and avoid expressing inflammatory political opinions in public. If the worst does happen, keep calm and file a report with local authorities immediately.